If correctly installed and working the way that they should be, garage door springs make it possible to enter and exit the garage without problem. Unfortunately, issues with this component can be fairly common. Homeowners who notice any of the following problems should call our experts straightaway for immediate repair. A crooked door is a sure sign that there is something wrong with the door springs. If one of the extension springs breaks, it will not be able to pull up that side of the door. While the door may still technically operate, it will be crooked and may even get stuck on the tracks when in motion. In addition, if an extension spring has broken, this can result in a jerky motion when the door is moving up or down. This can be very disconcerting. Again, because this part of your door can be dangerous and unpredictable, the best thing to do is call a professional if you notice these kinds of problems. Don't risk injuring yourself by touching this part yourself. Our experts will ensure the spring is replaced correctly and safe to use once more. 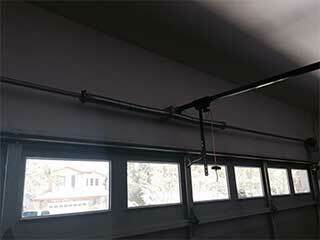 Garage doors are incredibly heavy, and it is up to the springs to carry their weight when they are in operation. If the door slams shut when closing instead of slowly lowering, that is a sure sign that one of these parts is wearing down or is already broken and needs to be replaced. At Garage Door Repair Baytown we have some of the best technicians in the area. We'll ensure you get the care you need for your door, no matter the problem. Whether you can see your garage door springs have already broken or are simply worn, call us today - we'll be glad to talk through your issue and arrange an appointment.